Last week, to celebrate months of hard work, Rent the Runway hosted HackWeek, a week-long hackathon. This was an opportunity to work with new technologies, hardware, languages, as well as coworkers outside of our usual teams. So on the Friday before HackWeek, we gathered in the kitchen to hear the pitches and decide what projects to work on. That same Friday, Rent the Runway received the AppleTV Developer Kit (Fun fact: we won it in the AppleTV lottery for just one dollar!) Naturally, the mobile team was itching for an opportunity to tinker with our new toy. On Monday, our team was formed. Its group members? Billy Tobon - Lead iOS Developer, Sandy Woodruff - Product Designer, and Lea Marolt Sonnenschein - iOS Developer. Simple to use: The user should be able to go through the entire app with just a few taps and flicks of the finger. Actually usable: Asset placement is important in tvOS. If two assets that can be hovered over are too far from each other, the user won't be able make the transition from one to the other. Sensible: There's actual value in creating a tvOS app. It complements your existing apps and doesn't just exist for the sake of having your app on all available platforms. FIRST LESSON LEARNED: If you actually want to build something usable, stick to your guns at a hackathon. If you don't care whether the final product works, feel free to explore. On Tuesday, things got off to a good start. We had a plan. TVGunn would be an app placed in Rent the Runway stores that could help users browse through their shortlists in-store. There would be iBeacons placed in the store to detect the user's shortlists, and automatically pull them up on the screen when the user's credentials were verified. This would help streamline the process of interacting with the stylist. Sandy created fantastic mockups, while Billy and I had a clear division of labor on the tvOS side. I was going to work on the app's frontend, while he would try to make our RTR Foundation Framework work with tvOS, so that TVGunn could easily talk to the backend. In the spirit of HackWeek, we decided to write the app in Swift - the RTR iOS app is completely written in Objective-C. Not only that, but we decided to use Storyboards, something many a mobile team dreads like the plague. SECOND LESSON LEARNED: Betas will be betas - things will break and there's nothing you can do about it. In order to develop for tvOS, we had to download the latest Xcode Beta - 7.1. We quickly learned that the Beta is called a Beta for a reason. 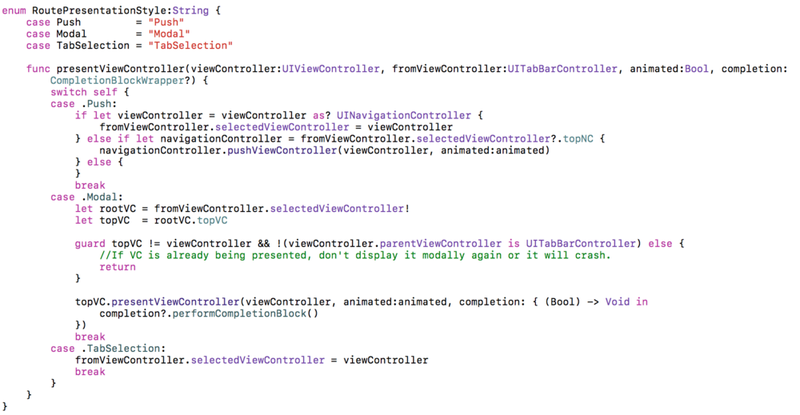 For example, using Storyboards resulted in a crash every time I tried to drag a new View Controller on the board. I ended up copying the default View Controller set up in the Storyboard 5 times to achieve the user flow that we wanted - #scrappinessisavirtue. THIRD LESSON LEARNED: Cocoapods don't play nicely with tvOS (yet). Despite the Cocoapods fix for tvOS, released on Wednesday, we couldn't import the frameworks we use in our iOS App as pods, so Billy ended up importing them into our project directly. That resulted in a massive amount of errors that took almost two days to debug. In the meantime, Sandy learned how to create LCR files and make use of Apple's new tools to design parallax icons - ParallaxExporter and ParallaxPreviewer. I, on the other hand, tried to figure out how to best mimic Apple's interface. When the user moves from one element to another, the second element has to expand and cast a shadow to create the feedback needed for the user to know what element they're currently on. While this is done for us in some UI elements, like the UITableViewCells, it's not done in others, like the UICollectionViewCells. In order to achieve the look and feel that the user expects, I had to learn how to use special Focus Engine Controls only available on the tvOS. We could play with this icon for hours! FOURTH LESSON LEARNED: Parallax icons look and feel fantastic. We played with that app icon just a little too long when we finally got it on the screen. FIFTH LESSON LEARNED: Don't count on everything you see in examples to be pre-built. I had to put in some muscle in order to get the interface looking and feeling the way Apple does in their examples. SIXTH LESSON LEARNED: Swift 2.1 has evolved-a lot. Make sure to always read the newest documentation carefully, instead of just assuming the old ways work. Otherwise you will experience unnecessary frustration. Swift offers a severely streamlined process of creating apps. Unfortunately, because Swift is still evolving, many of the language's aspects have changed with each iteration. Because of that evolution, learning from older examples proved to be a little difficult, because they didn't work with this new syntax. For example, background tasks and requests now have to be wrapped inside a try/catch block. SEVENTH LESSON LEARNED: Persisting data on tvOS is tricky. We knew from the documentation that there was no local store in the appleTV, and we planned not to persist anything in the device, but when we tried to use a SaaS solution (Parse) as a bridge between iOS and tvOS the app wouldn’t even load, because most of these types of frameworks use local store for caching. In the spirit of HackWeek, we ended up using Parse via REST, and storing user credentials to Parse in plaintext (a definite no, no in production apps) based on data received from the iBeacon. Inside the app, we used a timing function that periodically checked if a new user had appeared on Parse. If there was no user on Parse, the app would play the official RTR promotional video. If the user appeared, however, the app immediately redirected to their shortlists. By Friday, we ended up with a pretty solid working demo, and presented it to the whole company. Billy presented the hack and explained how it works, while Sandy and I did a small roleplaying sketch to make sure everyone understood our use case. Everyone seemed to enjoy it, and we're excited to explore its use. Even though, the demo was a success, we all know that the app has several problems, and is therefore not ready for production. Because this was HackWeek, though, we allowed ourselves to use not-so-stellar coding practices, pass data that shouldn't be passed around willy-nilly, and all in all, hack our ways until we made it work. EIGHTH LESSON LEARNED: Never use the "F*** it, ship it!" method. If you decide to make a hackathon project a production project, scrap the whole thing and start from scratch. This will allow you to follow good development practices, and create a well-maintainable product, instead of having a codebase with so many leaks, you spend more time working on covering up the problems, rather than fixing them and focusing on moving the product forward. All in all, HackWeek was a fantastic experience and a great success. Our team collaborated well and iterated quickly. We learned a lot of new things, and in the end produced a beautiful and exciting app using completely new hardware. I'm extremely proud of my team, and couldn't be happier I worked with them this entire week. We all can't wait to actually create a live Apple TV app, because we believe that the Apple TV has tremendous potential for how our customers can experience Rent the Runway!